As many experienced traders have learned, the NFP report is notoriously difficult to trade successfully. For one, the headline employment number is particularly difficult to predict due to the high margin for error. Counter-intuitively, a strong report often leads to weakness in the U.S. dollar (USD). This is because a large increase in U.S. employment is indicative of a growing global economy, which can prompt traders to sell safe-haven currencies like the U.S. dollar and buy higher-yielding currencies from other regions. Typically, economic releases lead to relatively straightforward outcomes in the market. For instance, if GDP growth expands more quickly than expected in Australia, the Australian dollar (AUD) will rally the vast majority of the time. 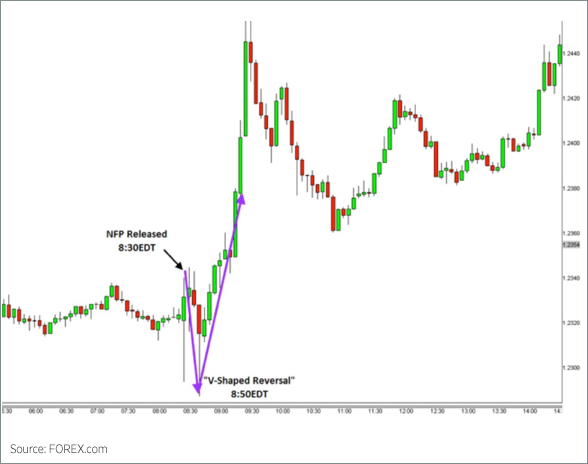 The NFP report, on the other hand, is infamous for “V-shaped” reversals in the wake of the release, where the market initially spikes sharply in one direction before reversing in the following 10-120 minutes and heading in the other direction for the remainder of the day. So how do you trade the V? Rather than trying to anticipate both the NFP number and the market’s reaction, wait until after initial volatility in the wake of the release settles down and try to catch the V-shaped reversal, which could offer a very favorable risk-to-reward ratio on a trade. Though a reversal is not inevitable (nothing in trading is), even catching a reversal 33% of the time can lead to a profit if the trader utilizes a strong risk-to-reward ratio. To further improve the probability of catching a reversal, traders should wait for a reversal candlestick pattern on the 5-minute or 15-minute chart. For a quick example, let’s look at the chart below. The NFP report printed at 146k, handily beating expectations of 89k. 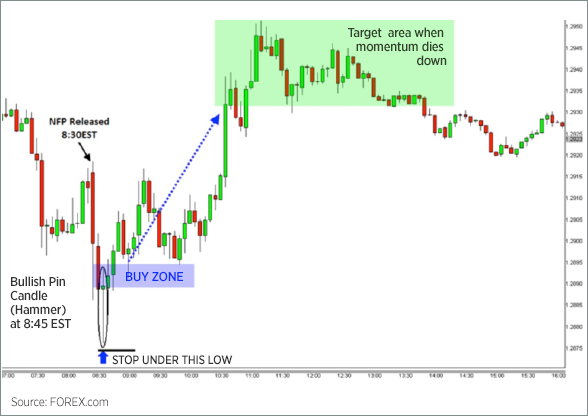 After initially dropping about 35 pips in the first 10 minutes, the EUR/USD put in a Bullish Pin Candle on the 5min chart, suggesting a possible shift from selling to buying pressure. This candlestick pattern was the signal to get into the trade; an entry near the close of the candle (around 1.2890) with a tight stop below the low (near 1.2875) would have given a low 15 pips of risk. As we can see, the pair eventually rallied all the way up to 1.2950, over 60 pips above the entry signal. While not all NFP reports will lead to such a sharp reversal (and traders generally won’t capture every pip of potential profit), this style of trading could offer trades with strong risk-to-reward ratios, allowing you to trade NFP without having to guess at the number or its market impact.